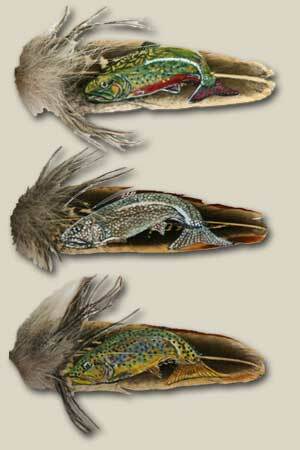 In this painting series you see three of Colorado's native trout. In order are: the Colorado Rainbow Trout, the Colorado Lake Trout and the Colorado Brown Trout. Available Sizes: 8" X 10"
Buy your Peg Fennimore art today. All Peg Fennimore Feather Paintings are created using acrylic on turkey or peacock feathers with a variety of legally and respectfully acquired feathers, leather and fur. No two are ever alike and every piece is numbered. Includes artist's certificate of authenticity.